Reaction to the president’s “dubious” reception of Judges after they announced his widely contested timeframe for the elections of complete two-year delay for no excuse reaffirmed the suspicion of international community that the judiciary fell into the hands of the executive becoming rubberstamp for the government and lacking of any independence much like the house of Parliament and Guurti. Despite the overwhelming disapproval of the decision by the vast majority of Somalilanders that were eager to see elections taking place on time, President Silanyo proceeded to force in courts his way out. Before, the Guurti Council has been an accomplice in the government bushing the timing of the election making sure to make meet their terms. Now, the Highest Court, the last resort for justice, sheepishly joined the government. The parliament was deeply divided over any issue because the government buys whole of stock whenever needed. The president suggested that he’s not in favor of unnecessary illegal extension against the National Election Commission (NEC). Their verdict was one year but overruled by Guurt Council and the Court, both institutions have nothing to do with elections! The NEC has a mandate to run elections in line of consensus of the three parties. They’ve to protest if any other institution violates their charter. The selective party between the president and the Judges portrayed how feeble the judges are because none of them turned down the president’s invite at the least to protect the perception of his role in neutrality. Closer sources say that they were rewarded for their biased verdict and marginalizing the opposition parties that put their confidence in the newly nominated committee led by ex-resident in Tribal Region of Pakistan. “The court acted in “good faith” and nobody’s pushover,” said Darfur trained in Sharia of hand chopping. However, the figurehead is a cousin of Amina the First lady for her essential role in his nomination; he consented to his brother-in-law, the president Silanyo. They got it. Foreign resident said the Court married not just to justice but also to the chair, meaning to power. The 7-members committee all novices are immature and very materialistic like Sheikh Samale who messed up the entire democracy during his search for coins and bucks. The more they look holier-than-thou the more money lovers they are and less justice. Bill Gates with so much human passion in his heart to alleviate the suffering of far corners of the world disproves the adage of all religious people are good people. Somaliland Highest Court’s move to pick the president’s favorite one of the two choices may jeopardize the country’s democratic journey of which many think might one day end up in global recognition. 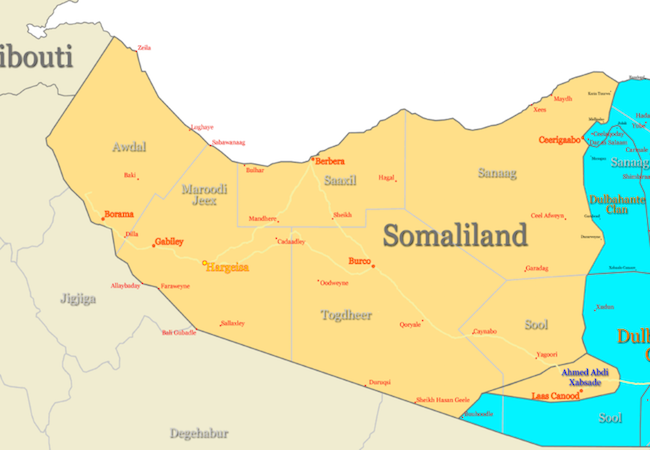 Somaliland entered disastrous episode. It took one step forward but two backward. The Islamists are one step away from introducing Sharia law. Yesterday, Ali Warana’ade informed the grand Imam of the largest Mosque in Hargeisa of vacating. Incoming Imams unlike moderate ones in charge of the Mosque are radicals to pollute the remaining minds and hearts of youth “I relocated my children to avoid the toxic, but my children inhale it because we live in ocean of extremism and fanaticism,” stated Mumin. For the past five years since Hirsi came in office, no terror attacks happened, but the secret behind is quite mystery, not that mystery for some. While suicide bombing hit hard Mogadishu despite Drone surveillances, and massive peacemakers on their shoulder, Hargeisa next door to it, remains terror-free since the ex-president left! European and Americans don’t decipher the reason. Sheikh Samale may do the bet. Rapid Response Unit RRU has a leisure time to kill children because they’re “terrorists” of some kind. In less than a week, a 12-year pupil and his little friend 14-year old were brutally murdered in the house, and in the custody respectively. The irony was the victim tribe forced to rebury ex-mass graves uncovered by labor by accident while their youth are regularly shot one after the other. Adan Siro, a rational Imam even participated in the shadow funeral and unknown whether these were rebels buried at once during emergency or civilians haphazardly covered in the light of flying shells overheads or killed by Siyad Barre’s genocidal regime. The courts neither issued subpoena to the Police Chief nor called any independent investigation of the civilian deaths as though no tragedy had happened! They were hugging the president and praying to stay in power for life. The president since came in office speak in sectarian terms pleasing the Wahhabi cult signaling how happy he’s for their doing. Since his arrival, he changed his tune to somewhat Wahhabi Imam “my brothers and sisters…” his speech starts with strong religiosity and ends with “wage the Jihad” in Somali. The call to change orthodox Imams in grand Mosque and installing of the radical Imams into Justice System are of telling. It’s an aftermath of gradual input by Islamists into core system. They have the president’s ear. The radical changes that taken place over the past five years, not in vacuum but in coordinated way, led the EU office closure, regional diplomacy dwindled, and UN lowering safety standard closer to Mogadishu level. Somalilanders gave up the elections and embraced the decision of the court that says some election may happen or of no elections if need be; they realized the system is change-resistant. President Silanyo’s coterie wants him in till to the death! Above all, the nationals are genuinely ask whether Somaliland will survive him if he dies or decides to leave the scene. The things are not in good shape now. As the whole looting began, the economic viability of Somaliland is serious questioned by the folks when more than half of Somaliland public ponder to escape because the government doubly taxed the basic food items therefore bread disappeared from the kitchen. The Islamists calling the shots are quite troublesome also. The decision of the court , however, to announce whatsoever and whenever the president wants is right is utter failure of entire justice and the next elections, if any, would be quite similar to that of Iran where clergy regulates democracy, decides who’s who, drink coffee over it, and cancels it if they’re not in good mood.